When I first met my husband he was convinced that he was “allergic” to mushrooms. He had somehow lived his entire life believing that mushrooms, along with a few other foods, caused a very slight allergic tingle in his throat that (in his words) made him go “eh”. When he described the reactions to his “allergies” to me, I knew immediately that he was full of it. I myself have always loved mushrooms though, so I made it my mission to convince him that these food allergies were all in his head. I was relentless. We had just started dating, so he didn’t yet know just how stubborn and determined I can be when I think know I’m right, and he was eventually forced to give in to reason and logic. While he finally admitted that most of the foods in question were ones that he just didn’t like, mushrooms ended up being something that he decided were worth giving another try. To my surprise (and delight) he ended up loving them! I don’t even really understand where he’d picked up the idea he didn’t like (or was allergic to) mushrooms in the first place, but now we eat them all the time! No throat tingle, no “eh”. I think that adding mushrooms to a dish is an easy and affordable way to add a hearty richness to foods that might otherwise be bland and boring. I always find myself wanting to “beef up” my dinners with the meaty earthiness of mushrooms as soon as the weather starts to turn cold. As much as they’re kind of assertive and distinct, mushrooms also seem to be incredibly versatile and go with a huge variety of foods and flavors. Back when I was single, and tended to spend more of my money on barhopping than recipe planning, I used to use mushrooms as a way to either stretch whatever protein I was cooking, or replace it altogether. 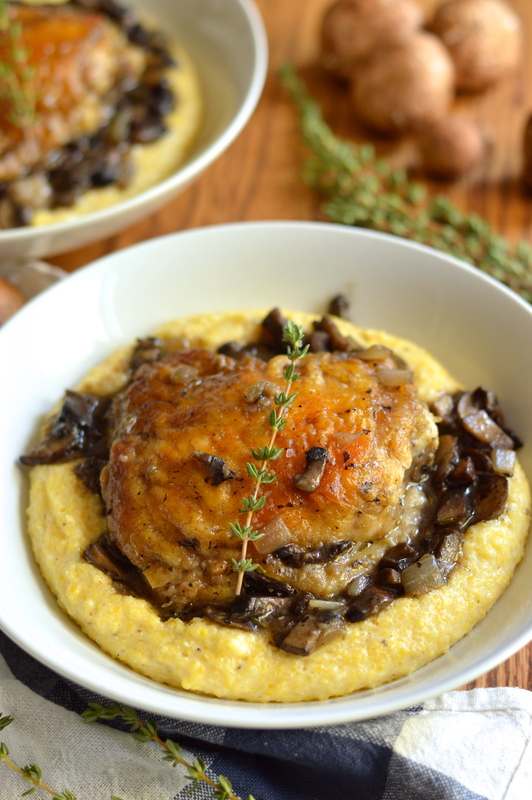 When I was in the mood for something that felt sort of decadent and “fancy”, but didn’t have much time or money to spend on it, I loved to sauté mushrooms in butter and pile them up over some creamy polenta. If you’re not familiar with polenta, you need to be. It’s super easy and cheap to make, and only takes about 20 minutes. It’s little more than cornmeal porridge, but the addition of chicken stock and a little butter and cheese make it somehow seem wonderfully rich and elegant. Creamy polenta tends to be the simplest and easiest preparation, but if you let it set up and get firm after cooking you can even slice it and grill, bake, or fry the wedges or sticks. While white buttons used to have the mushroom monopoly, these days you have a few more options at the grocery store than that. While I do like their texture, I think that buttons tend to be a bit bland, so if you want to use them I’d suggest mixing them with another, more flavorful, variety. If you’re really into mushrooms and want to play with flavors and textures, go wild and use a mix of trumpets, hen-of-the-woods, and shiitakes (just be sure to remove the stems). Some of those varieties can be a bit on the pricier side though, so to get a big bang for a little buck I like to use a mix of creminis and portobellos. The best part of this meal is how cheap and easy it is to throw together. You can have dinner on the table in under an hour, and everything that goes into it is super affordable. I’m sure I sound like a broken record here, but chicken thighs are my absolute favorite. Besides being cheap, they’re also way more flavorful than breasts and have a much nicer texture and don’t dry out when they’re cooked through. This meal is perfect for fall. 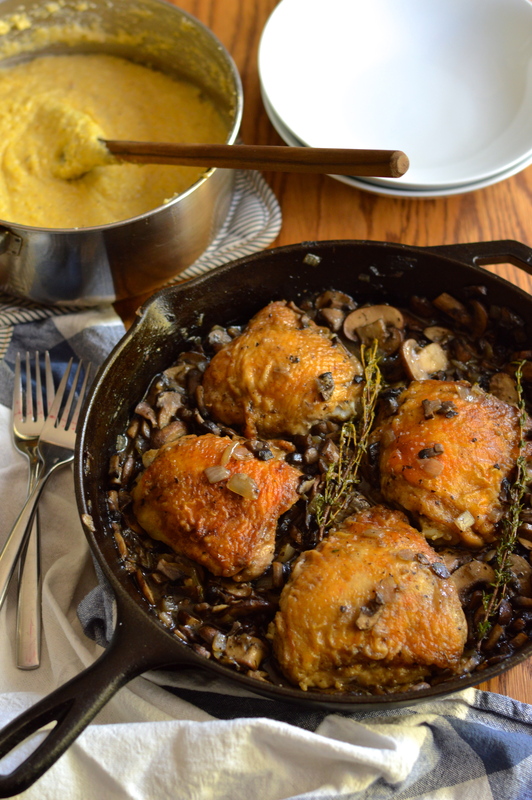 The chicken thighs are tender, rich, and super flavorful. 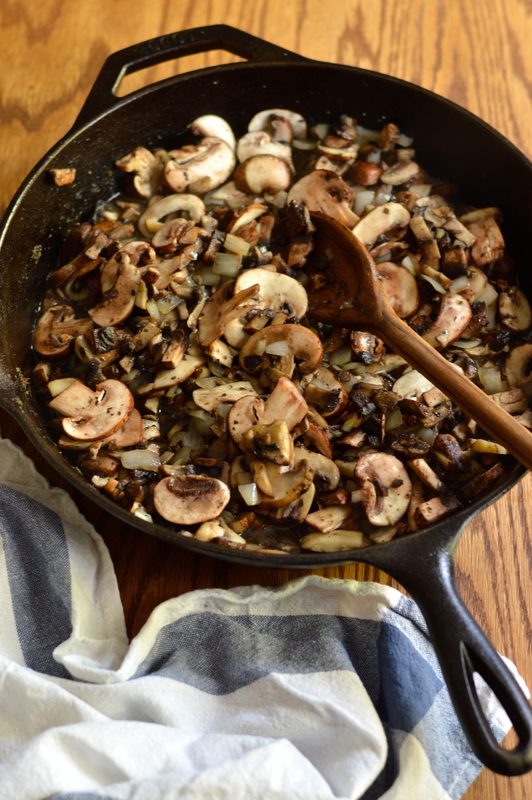 The mushrooms have a great rustic meaty flavor and texture and help make this meal feel really filling and substantial. The wine adds a really subtle fruitiness and helps build depth, while the thyme adds a distinctive earthiness. 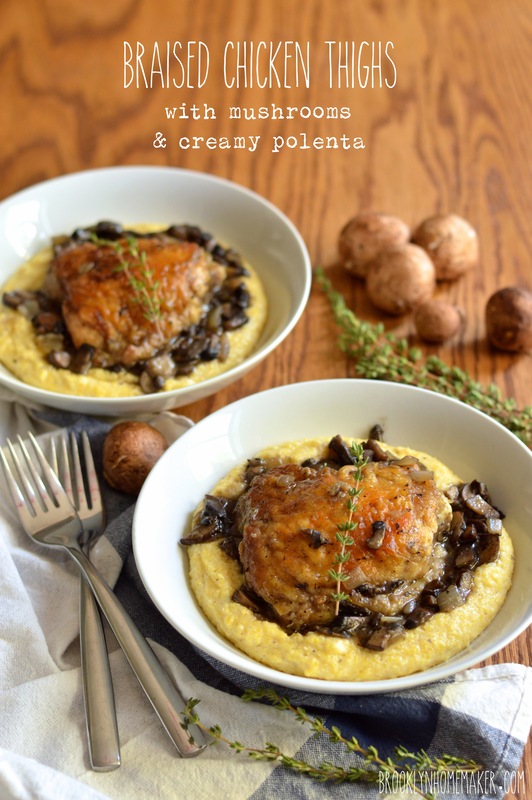 Polenta is the perfect creamy complement to all the rich and solid flavor going on here. Generously season chicken thighs with salt and pepper. Coat each piece with flour in a small dish and set aside. Preheat a large cast iron skillet over high heat, melt the butter and add the chicken pieces, skin side down. Brown each piece for 5 minutes on each side and remove to a plate to rest. Add onions and mushrooms to pan and season with salt and pepper. Sauté until the mushrooms give off their liquid, and continue to cook over high heat until liquid is almost completely reduced, about 10 minutes. Stir in the wine and chicken stock. 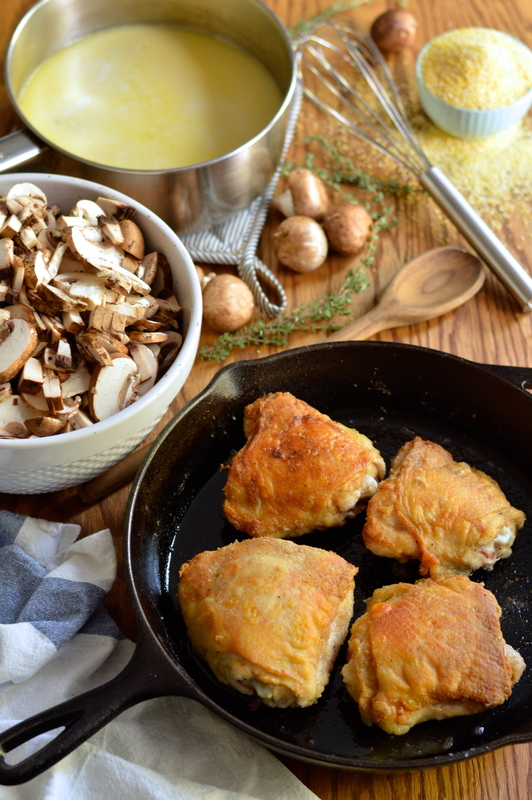 Gently press the chicken pieces down into the mushrooms, and add the thyme sprigs. Reduce heat to just shy of medium and let simmer until liquid is reduced and chicken is cooked through, about 20 or 25 minutes. Meanwhile, make the creamy polenta. Heat the stock, water, & milk to a low simmer in a medium saucepan. Generously season with salt and pepper. Gradually whisk in the cornmeal making sure there are no lumps. Stir regularly until the polenta is very thick and creamy, about 20 minutes. Remove from heat and stir in grated cheese. Taste and adjust seasoning if necessary. Once chicken is cooked through, remove thyme sprigs. Spoon polenta into a bowl and top with mushroom mixture and some reduced liquid. Top with a piece (or two if small) of chicken. It definitely is comfort food! Hearty, filling, and super satisfying! This is a meal made in heaven! 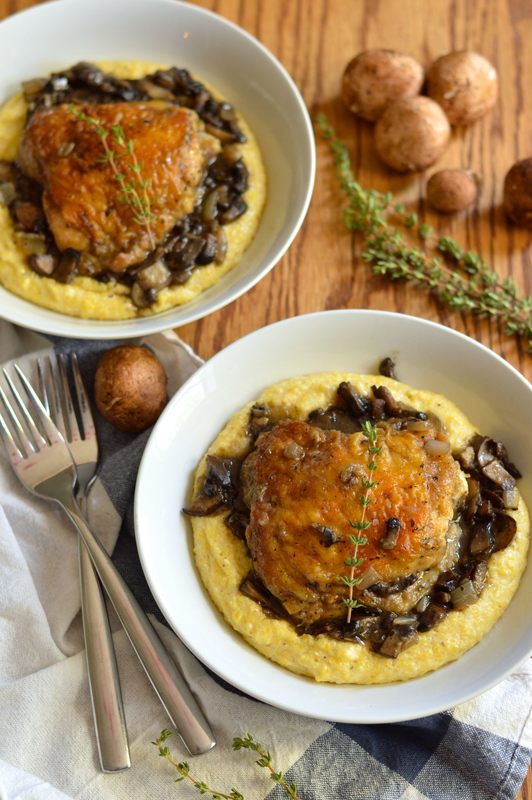 Your chicken has a wonderful crust, and I could go swimming in the polenta. I think people think mushrooms are slimy. I’ve never met one that was anything but Amazing! Thanks for another great meal Tux! Oh man, now I want to go swimming in polenta! I know a lot of people who definitely don’t like mushrooms, so I’m really glad that Russell gave them another shot and loved them! My husband also has crazy food ideas… I have gotten rid of some of them, but other things are a lost cause. Thankfully we both like mushrooms. This looks wonderful! Great post! Yeah same here. To this day Russell won’t go anywhere near an egg, but you have to pick your battles I guess. Eggs? Wow! Thought my mama was the only one who won’t eat eggs… David will not eat sweet potatoes!! Can you believe that?!? Says they taste like “Sweet Dirt”. Even if they are in a sweet southern sweet potato casserole with pecans and brown sugar… Yes, pick your battles indeed!! The entire meal just screams perfection, Tux..love it! Thankfully now when he doesnt like a food he just says he doesnt like it! that looks like the perfect autumn dinner! 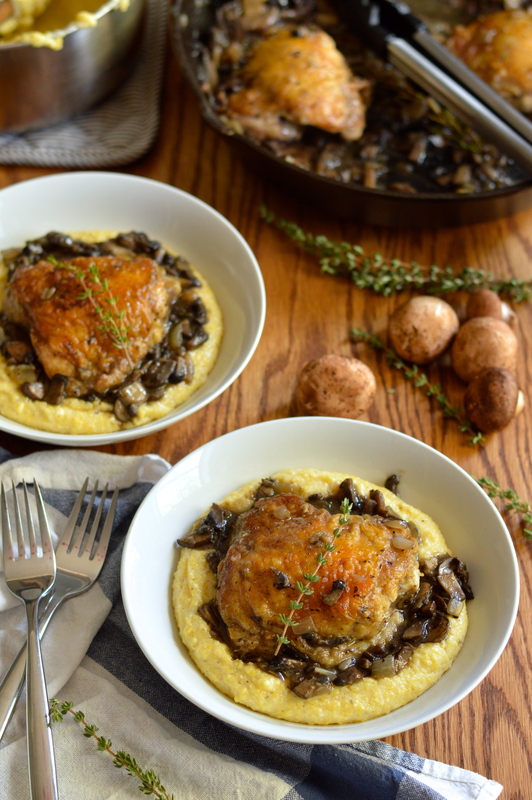 This makes me remember my grandfather, he would make this very similar dish using either chicken thighs, wings and drumsticks, or rabbit legs braised for a few hours and then topped over the polenta, the very definition of comfort food. Thanks for the reminder. Braised rabbit legs done this way sounds absolutely amazing!!! I definitely don’t make polenta enough – thanks for the inspiration.. I definitely will be making some tonight! My girlfriend is going to be so happy that I found this. Thank you for dreaming up this vision! So glad I could help!!! Thank you so much! So glad you and your family enjoyed it!